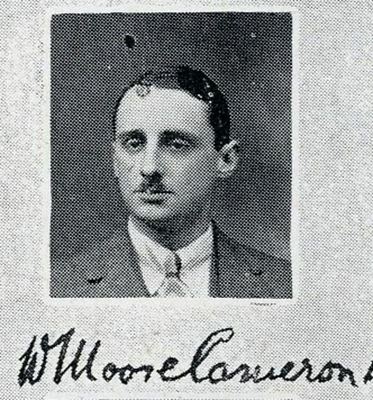 William Moore Cameron graduated MA from the University of Glasgow in 1913 and MB ChB in 1916. He was born in Dumbartonshire, son of John, a physician. After graduation Cameron joined the Royal Army Medical Corps (RAMC), and served as a Regimental medical officer to the 2nd Battalion Black Watch in Mesopotamia and Palestine, as well as in India, Constantinople, Egypt, and Malta. In 1939, he commanded a field ambulance in France and afterwards a RAMC depot and training establishment in Leeds. He later returned to India for a staff appointment in a field formation. He then went to Iran as Assistant Director Medical Services (ADMS) of a division. Lastly, he served in Austria and assisted the British Army of the Rhine before he retired as a brigadier in 1949. After his retirement, he was the chief medical officer to the Overseas Food Corporation in Tanganyika and became ADMS (Civil) to the Government of Cyprus at Nicosia. He settled in Cyprus and stayed there throughout the conflict between Turkey and Cyprus.